The State Fair starts August 8th!! We’re going to have a great booth this year! 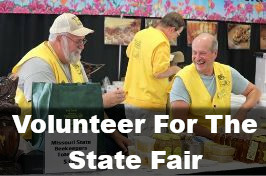 I wanted to invite you to come spend a day with us, as a volunteer, at the Missouri State Fair. 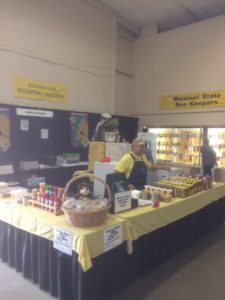 The MSBA has had a booth at the Missouri State Fair for many years where we promote the honey bee and sell honey and other bee products such as lotion, soap, wax, honey ice cream, and more. The state fair is a key event that helps the MSBA fund our conferences and field days. 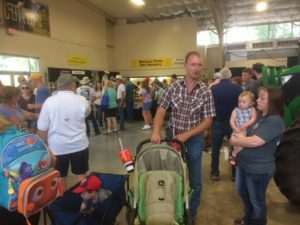 The Missouri State Fair runs for 11 days in August in Sedalia, Missouri. The dates for 2019 are August 8-18th. 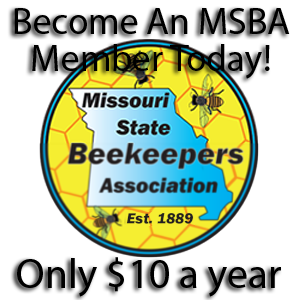 The MSBA’s booth is open for business all 11 days and so we ask, each year, for volunteers to help man the booth. We break each day into 2 shifts 10:30 a.m.- 2:30 p.m. and 2:00 p.m.- 6:00 p.m. Some local bee clubs pick a day and have volunteers from their club fill an entire day. If your club would be interested, we could help you find a day that works. If you want to come as an individual or with your spouse that would be great as well. You don’t have to be an expert beekeeper to work at our booth. Most of the public has zero knowledge about bees so even if you offer basic information they are thrilled. 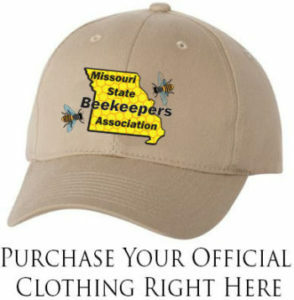 Plus there will always be other beekeepers around to help answer any difficult questions that arise. Man the observation hive. This is one of my favorite jobs at the State Fair. It’s the most exciting thing, next to the honey sticks, that draws the public in! This is the first time many of them get to see live honey bees and they always enjoy trying to find the queen. Plus it’s a great tool to show honey, eggs, larvae, workers, drones, and pollen and all the workings of a hive. If you aren’t a big people person we could always use your help restocking the table with honey and other products or passing out ice cream. We have a job for everyone!! Each volunteer will receive a free admission ticket into the fair. You must be signed up before the day you are to work to receive your ticket. You will also receive 1 free container of honey ice cream! !